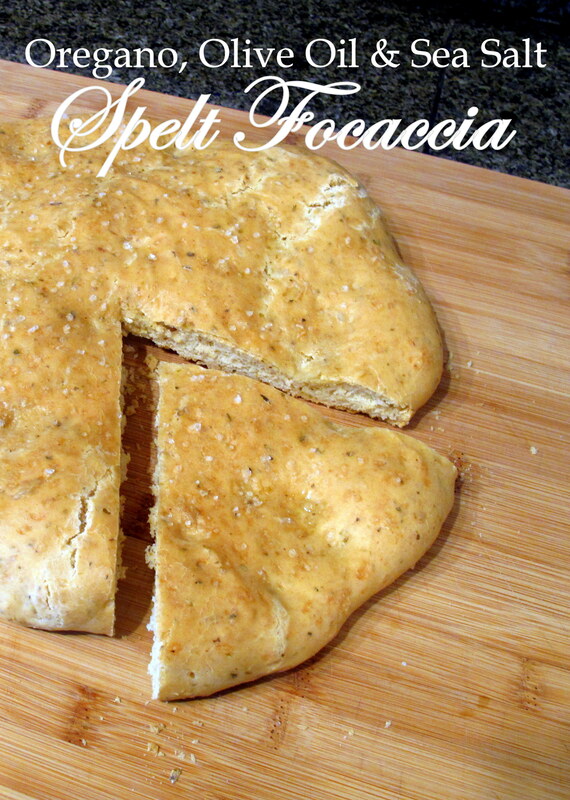 Who doesn’t love a focaccia? When I first started my science degree (pre-FM diagnosis), my Mum informed me that I needed to learn to take care of myself and that part of that was to make my own lunches from now on. Say WHAT?! I had to be an adult? Initially, my dad took pity on me and made some awesome sandwiches with Mama’s (his mum) homemade bread; I think that making a “school lunch” was such a novelty for him that he even had fun. Well, it turns out that Mama’s little bread maker couldn’t keep up with the increased demand – more like the doubled fruit in the fruit loaf that she also made for Dad – and it carked it not long after. Nice work, Dad! What was I going to do? I’d gone from Wonder White bread to fresh, thick cut deliciousness and I didn’t want to go back. I hit on focaccia bread as a good solution and went from there… for about 4 more months until my FM diagnosis meant no more wheat for me. It was a good run while it lasted. I haven’t had focaccia since then (2006)… until now. It took a few attempts but I’ve finally perfected a spelt focaccia loaf. All is right with the world. 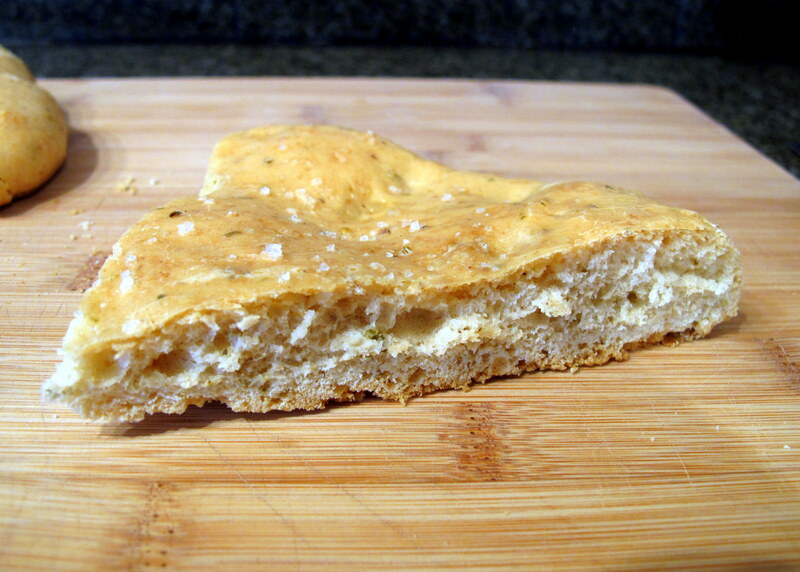 This focaccia has a light oregano flavour, combined with a crispiness from the olive oil and a delicate sea salt finish. Evgeny and I might have finished one in a day. Whoops. Spelt (Triticum aestivum subsp. spelta) is an ancient form of wheat that hasn’t been tinkered with and contains gluten that is said to be more readily digestible (due to it being more water-soluble than that in modern day wheat), so is potentially better tolerated by many who react to normal wheat. More information here. Like rye, spelt flour is generally better tolerated than wheat flour among fructose malabsorbers. Also like rye, spelt does still contain fructans and is not tolerated by everyone on a low FODMAP diet. For this reason, I would recommend trialling a small piece before you go all out and scoff the loaf. 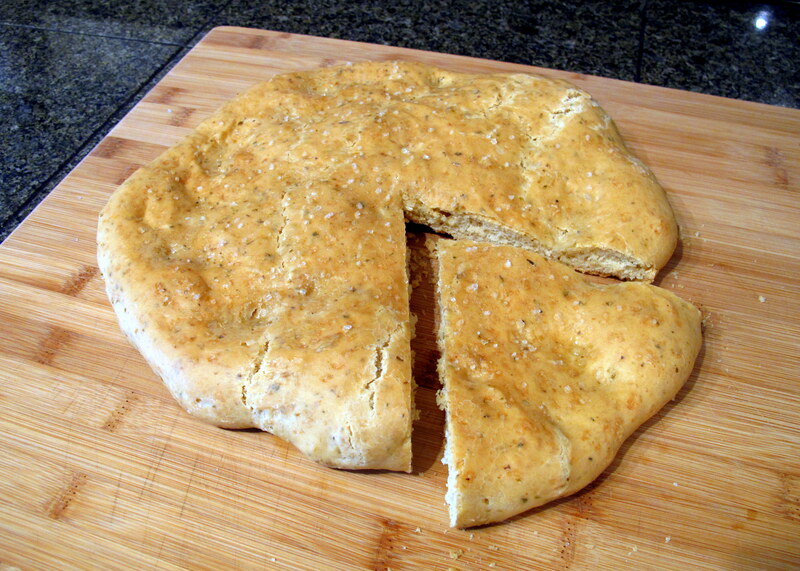 Makes one 12 inch/30 cm focaccia. 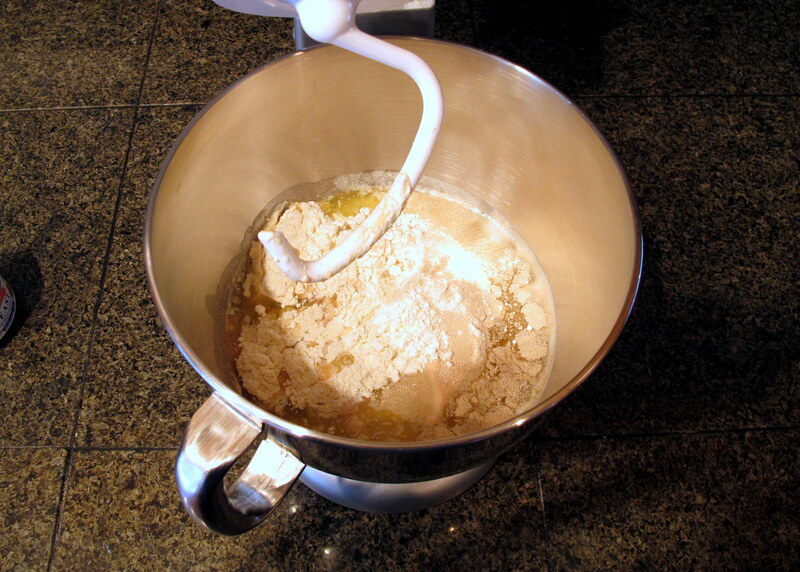 Place your mixing bowl on a set of scales and weigh in the spelt flour, water and olive oil. Add in the rest of the ingredients (except for the sea salt) and, using the dough hook, knead on a low speed for 2 minutes until everything has combined. Cover the bowl with a tea towel and let it sit for 10 minutes. 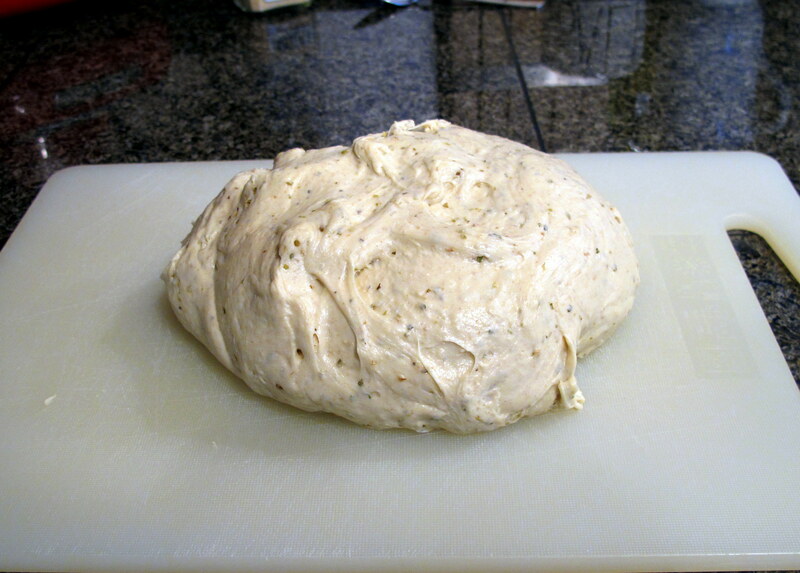 Now, knead on a medium speed for a further 7-10 minutes before the dough is left to rise. Alton Brown has a really nifty trick – he boils water and pours it into a baking dish placed on the bottom rack of the oven. 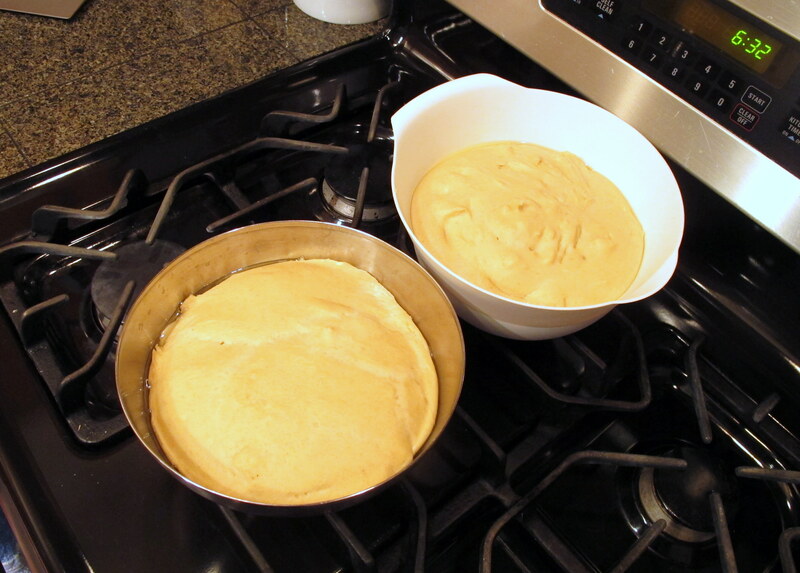 Put your mixing bowl with dough in the oven and close the door, leaving the oven OFF. The warmth and humidity will help the dough rise; this normally takes 1-2 hours, just keep an eye on it. If you want to start this the night before, cover it with a slightly damp tea towel and leave it in the fridge overnight before continuing on the next day. If you do this, the dough should double in size overnight but if it hasn’t, just leave it in a warm spot (or use AB’s oven trick) until it has doubled from its original size. 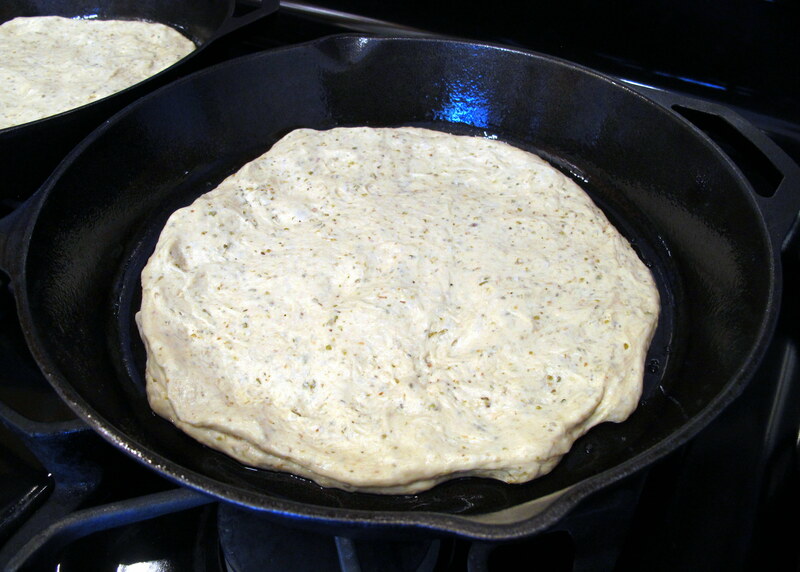 Once the dough has doubled in size, knead it gently on a lightly floured bench for a couple of minutes and then dump it into a well oiled cast iron pan (or your pan of choice). 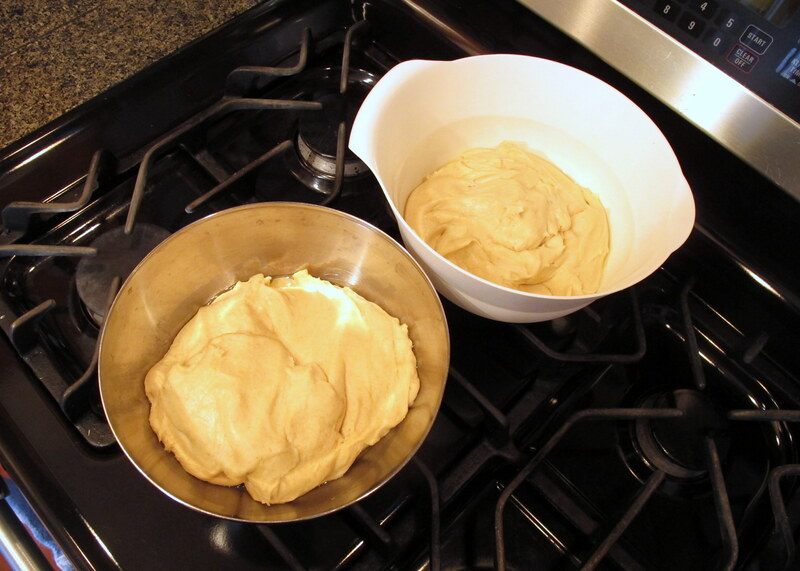 Press the dough softly to gradually spread out over the base of the pan – it should end up approx. 3 cm thick and it doesn’t have to reach the very edges of the pan. Let the pan sit in a warm (neither hot nor cold) location for about an hour and let it rise some more but it won’t rise much. Pre-heat your oven to 230 C/450 F – this is important, bread must go into a piping hot oven to help a crust form. Meanwhile, if you like your focaccia to have the dimples in it, just press your fingers in and make evenly spread holes. I like mine to remain a little fluffier, so I don’t do this. Finally, sprinkle the sea salt over the top of the unbaked focaccia. Bake for 30 minutes. 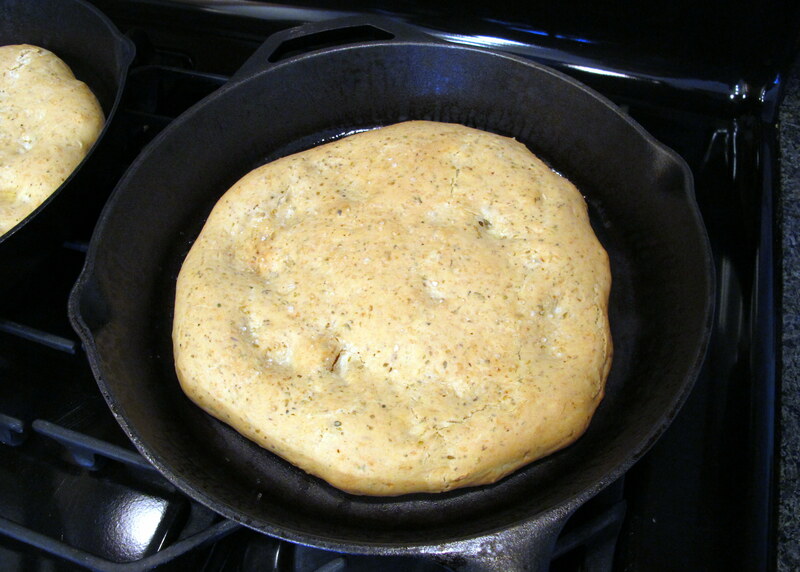 The focaccia should be a light golden brown colour and it will smell amazing. One important thing to remember is that there will be residual cooking after you remove it from the oven, so if it looks completely done just out of the oven, it will be over done by the time it’s cooled. Enjoy fresh as is, pair it with a hearty soup, or use it as a sandwich bread once cooled. This entry was posted in Lunch and tagged Australia, bread, focaccia, FODMAP, FODMAPS, fructose friendly, fructose malabsorption, gluten, herbs, home-cooked, homemade, low fructose, olive oil, oregano, recipe, rye, sea salt, spelt, university, vegan, vegetarian. Bookmark the permalink. I’m so confused trying to understand my new FODMAP diet. I read that sourdough was supposed to be ok if it’s done the slow way with no added yeast. Now, it looks like sourdough bread is made with sorghum which supposedly is bad. I’m confused and frustrated. True sourdough (the low rise sort) has low FODMAP serves (check the Monash app) when it is made of either wheat or spelt. 100 g of sorghum flour (from the UK) is actually rated low FODMAP by Monash Uni, so a traditional sourdough made with sorghum should be safe, too. I really recommend the Monash Uni Low FODMAP app, it has regularly updated and reliable information. A FODMAP trained dietitian is also a good idea. Good luck with it all and feel free to ask any more questions.